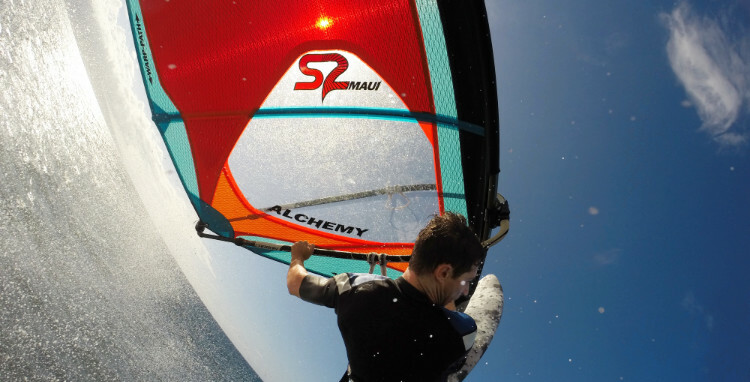 The S2Maui Alchemy creates a new legacy as an incredibly smooth, stable and versatile 5-batten wavesail with the greatest top-end wind range. Classic, neutral handling during wave riding combined with outstanding stability and power allow the Alchemy to excel in all high wind wave and bump and jump conditions. Superior upwind ability gets you back to take off points faster, and its perfect balance gives con dence in the air. Covering and exceeding the abilities of traditional power, sideshore and bump and jump sails, the Alchemy provides the magic combination of exceptional control, stability, power and effortless handling, no matter what the conditions. Increased use of SpaceLight™ further reduces weight and provides a smoother and more responsive feeling. Fine-tuned shaping and a classic 5-batten skeleton yield a very versatile design. Moderately low aspect ratio adds maneuverability and improves acceleration.